Overview of Problems and Potential. Energy Demand. Lignocellulosic Resources. Global Availability of Lignocellulosic Materials. Nature of Lignocellulosic Materials. Applications in Biotechnology. References. Biosynthesis and Biodegradation of Hemicelluloses. Biosynthesis of Hemicellulosic Substances. Chemistry of Hemicelluloses. Enzymatic Analysis of the Structure. Biodegradation of Hemicelluloses. References. Extraction of Pentosans from Lignocellulosic Materials. Enzymatic Treatment. Physical Treatment. Milling. Chemical Treatment. Thermal Treatment. References. Microbial Uptake of Pentoses. Mode of Sugar Uptake. Pentose Uptake in Yeast. Pentose Uptake in Bacteria. Regulation of Pentose Uptake. Genetic Studies on Pentose Uptake. References. Microbial Metabolism of Pentoses. Metabolism of D-Xylose. Regulation of D-Xylose Metabolism. Metabolism of L-Arabinose. References. Microbial Production of Ethanol. Microorganisms used for Ethanol Production. Kinetics of Growth and Product Formation. Simultaneous Pentose Isomerization and Fermentation. Whole Cell Immobilization. Coculture. Performance on Natural Substrates. Factors Affecting Ethanol Production. References. Microbial Production of Acetone and Butanol. Microorganisms used for Acetone-Butanol Production. Kinetics of Growth and Product Formation. Performance on Natural Substrates. Factors affecting Acetone and Butanol Production. References. Microbial Production of 2,3-Butanediol. Microorganisms used for 2,3-Butanediol Production. Kinetics of Growth and Product Formation. Reactor Systems. Performance on Natural Substrates. Factors affecting 2,3-Butanediol Production. References. Microbial Production of Organic Acids. Acetic Acid. Lactic Acid. Citric Acid. Propionic Acid. Itaconic Acid. Fumaric Acid. Mixed Acid Fermentation. References. Microbial Production of Xylitol. Microorganisms used for Xylitol Production. Kinetics of Growth and Product Formation. Factors Affecting Xylitol Production. References. Microbial Production of Single Cell Protein (SCP) and Single Cell Oil (SCO). Microorganisms used for SCP Production. Microorganisms used for SCO Production. References. Microbial Tolerance to Solvents and Organic Acids. Effect of Solvents and Organic Acides on Cellular Physiology of Microorganisms. Adaptive Modifications in Microorganisms. Manipulation of Membrane Lipid Composition and Tolerance to Solvents. Genetic Basis of Tolerance to Solvents and Organic acids. References. Genetic Improvement of Pentose Fermenting Microorganisms. Screening and Mutagenesis. Genetic Recombination. Gene Cloning, Expression and Characterization. References. Process Evaluation and Bioengineering. Pretreatment of Substrate. Fermentation Design. Downstream Processing. Economic Evaluation. Future Prospects. References. Index. Microbial utilization of the inexhuaustible lignocellulosic biomass for the production of industrial chemicals, liquid fuels, protein-rich feed and food, and preparation of cellulose polymers, is an attractive approach to help meet energy and food demands. Whilst biomass has served as substrate in microbial processes for the production of alchololic beverages for a long time, it is only recently that broader applications of this material have been envisaged. Hemicellulose-derived sugars have many potential uses in the production of industrial chemicals and solvents. Considerable developments have been made, not only in the improvement of yeast and recombinant bacterial strains, but also in the bioprocessing of these organisms during the last two decades. 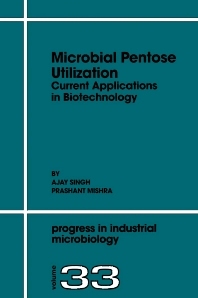 Although the volume of information available on microbial pentose utilization is increasing, the available literature is mostly scattered. A comprehensive account of recent advances in pentose based bioprocesses is provided along with suggestions for future research. An indispensable volume for graduate students of microbiology, biochemistry, biotechnology and biochemical engineering. The needs of industrial microbiologists, environmental scientists and researchers in the area of carbohydrate utilization and metabolism are also catered for. Industrial organizations involved in developing processes for ethanol and other products from non-conventional sources will also find this volume beneficial.